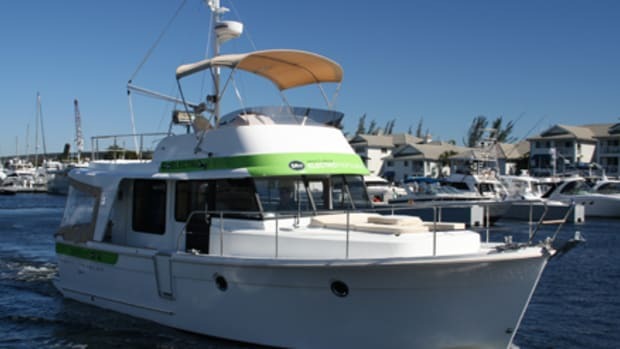 For more than 30 years, the Mainship brand of mid-size trawlers and Downeast-inspired power cruisers was a major force in this popular market segment. Now under new ownership, David Marlow is breathing new life into the classic company. 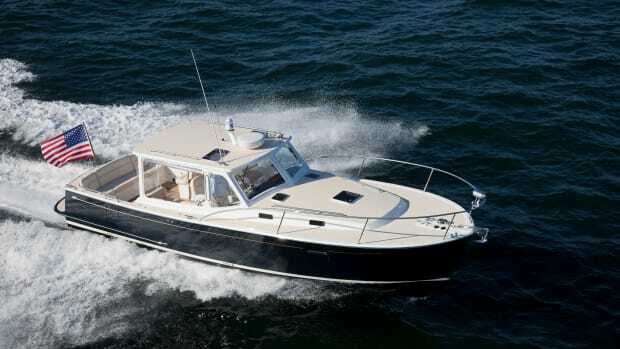 For more than 30 years, the Mainship brand of mid-size trawlers and Downeast-inspired power cruisers was a major force in this popular market segment. The company’s middle-of-the-road approach was very successful, as its product line offered traditional good looks, decent quality and reasonable pricing. Indeed, Mainship gained a well-earned reputation for good value—it was simply a lot of boat for the money. But the economic downturn that started in 2007 was too much for the parent company, which also owned Hunter Sailboats, Luhrs and Silverton, and it filed for bankruptcy in 2012. Seeing an opportunity where others saw disaster, boatbuilder David Marlow purchased the remaining assets of Hunter and Mainship that same year. The 37 is attractive on the water from any angle. 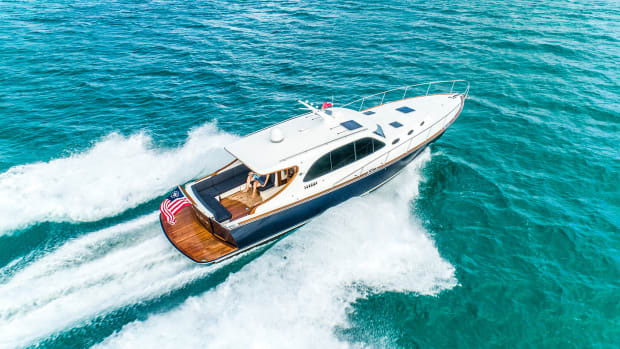 Known for building his own brand of pilothouse motoryachts in China, Marlow is a well-weathered mariner who grew up in Florida, building small craft under his father’s eye. A marine industry version of the Renaissance man, he started a houseboat rental company in the 1970s and then took up sailboat racing in the 1980s. He later opened a full-service yard on Snead Island, Florida, where he became one of the largest Grand Banks dealers in the U.S. Beyond Marlow’s talent for building, servicing and selling boats are his shrewd business practices. Following a short stint of building boats in Taiwan, Marlow eventually set up shop in Chi Hu, China, where his luxurious Marlow Explorers are built. 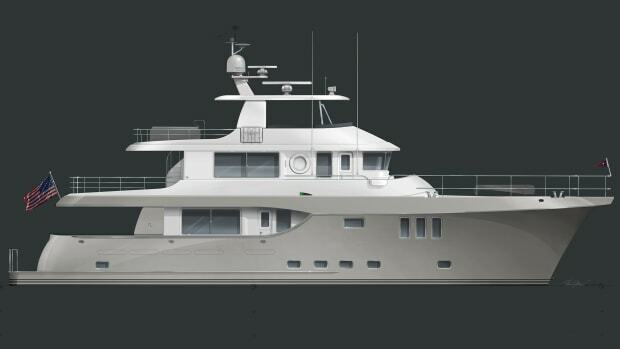 Ranging in size from 49 to 97 feet, these modern-day trawlers are made using Marlow’s advanced construction techniques and high-tech materials, and today they are among the leaders in the upscale yacht market. A couple of years ago the ever-energetic Marlow also introduced his Prowler 37 Series of uniquely styled express cruisers using similar construction methods. Convinced that the technology and overall approach to boatbuilding he had developed in China could be applied to a rejuvenated Mainship product built in the U.S., Marlow went about cleaning up and reorganizing the existing Hunter factory located in the small town of Alachua, Florida, near Gainesville, where he would also build his new Marlow-Mainships. 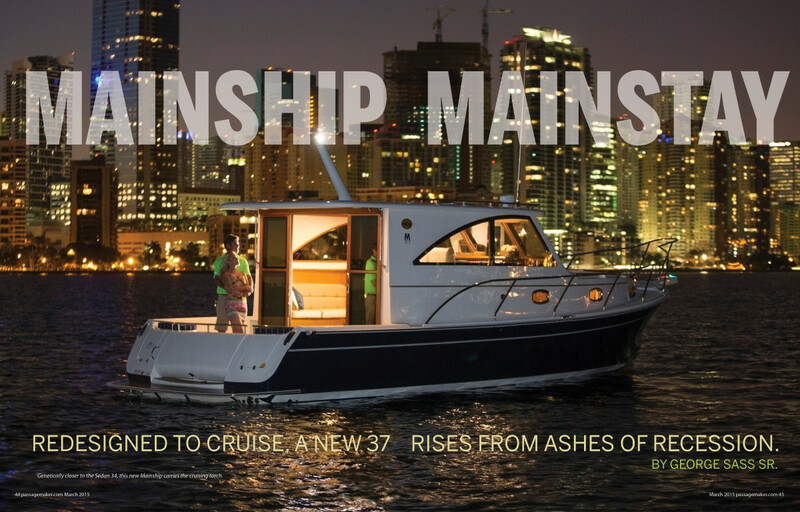 In the summer 2013, the first Marlow-Mainship 32 was launched, revealing an entirely different boat from the previous Pilot series, which for many years took its styling clues from New England lobster boats (See “Re-Imagining Mainship” PassageMaker, March 2014 or web extra above). Compared to the “originals”, the new Marlow-Mainship 32’s construction is as different as its styling. Using a resin infusion process, vinylester resins, superior fabrics and Nida-Core material above the waterline, the new hulls are stronger and lighter. Kevlar and carbon fiber reinforce areas that are subject to high stress, such as the strut keel. 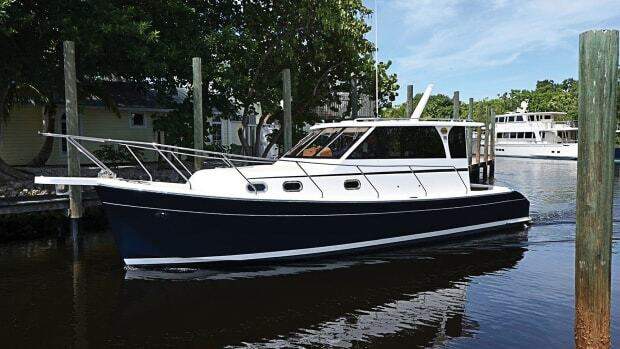 WATCH: Video review of the 37&apos;s smaller cousin, the Marlow Mainship 32. Initial reaction to the new look featuring a reverse transom and lower freeboard, however, was mixed, proving that it’s often difficult to please those who have an emotional investment in the past. But Marlow’s eye was on the future, and it was clear he was on track to building a better boat. Hull No. 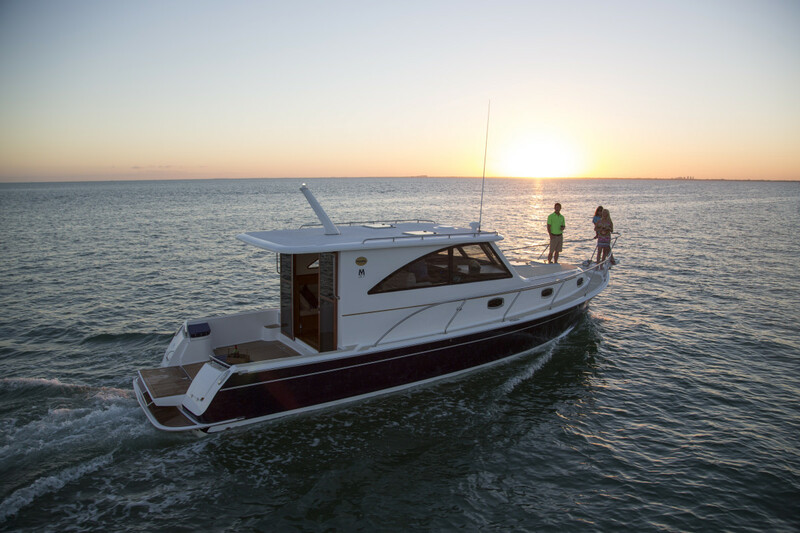 3 of the all-new Mainship 37 was delivered to its Chesapeake Bay dealer, Lippincott Marine, in time for the 2014 boat shows in the fall. At first glance, her gleaming flag blue topsides, sweeping sheer and reverse transom stood out from the dozens of older Mainship Pilots along Lippincott’s dock. One’s eye follows a raked windshield to large fixed sections of tinted glass in the cabin sides, which terminate at a vertical bulkhead of floor-to-ceiling sliding glass door framed in stainless steel. As with the Marlow-Mainship 32, the 37’s freeboard appears a bit low relative to the height of the house. For example, the height from the cockpit sole to the roof overhang is a very generous 7½ feet while the height of the cockpit sole to the gunwale is a mere 24 inches. The 37’s extra length helps to mitigate what some might consider a slightly top heavy profile. Overall, the 37’s exterior style represents a fresh, modern interpretation of yesteryear’s popular Mainship Pilots. At first glance, her gleaming flag blue topsides, sweeping sheer and reverse transom stood out from the dozens of older Mainship Pilots along Lippincott’s dock. Right away it is apparent that a lot of thought has been given to the smallest details to make this a cruiser-friendly boat. Richard Lippincott, a longtime Mainship dealer, enthusiastically pointed out many of the improvements designed to attract a new generation of buyers. The reverse transom swings down with a flip of a switch making it flush with the cockpit sole, providing easy access to the water. Overall, the cockpit measures nearly 10 feet wide by 6½ feet in length. With the transom lowered, the cockpit becomes even bigger, like one huge swim platform, with enough room to pull aboard a small dinghy or a couple of kayaks. 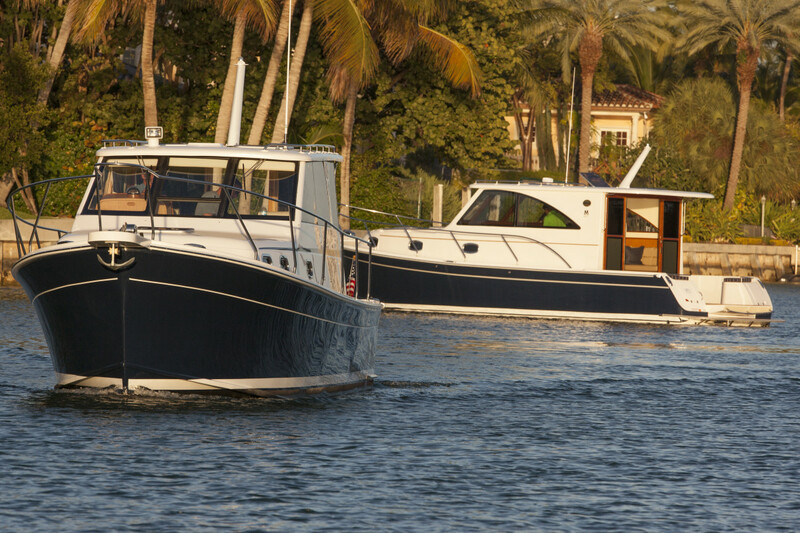 Two small seat lockers, one on each side of the transom, are perfect for stowing dock lines and fenders. A limited amount of built–in seating allows the owner to add deck chairs and move the saloon table to the cockpit. Extending halfway aft from the bulkhead’s sliding door, the cabin’s roof provides partial protection from sun and rain. It would be easy to add a simple canvas extension for full cockpit coverage. A swim ladder integrated into the teak-covered swim platform is hidden from view until deployed. Located in compartments at the after end of the cockpit, shore power, cable TV connections and the outdoor shower fixture are easy to reach. Up front there is a nicely finished V-berth stuffed into the vessel&apos;s bow. While the opening reverse transom creates a challenge for stowing a dinghy and outboard when under way, a number of storage/retrieval systems might work with some creative modifications. The trick to most of them, such as the popular Sea Wise or Weaver bracket system, is that the dinghy would have to be launched and detached from the swim platform before lowering the transom. It may also be possible to install davits on each side of the fixed transom. Otherwise, a roof-mounted, electric davit could be installed (with a proper load-bearing structure) for stowing the dinghy with its outboard on the cabin roof. This would require the removal or repositioning of the short mast, which is typically used for mounting a radar dome. As this was the first 37 Richard Lippincott had ordered and received, he hadn’t yet worked out all these details. But considering this boat will be popular with serious cruisers, a satisfactory method for stowing and handling a dinghy will surely be found. A hatch in the cockpit sole aft provides access to the steering gear, batteries and stowage. Forward are two more hatches, side by side, each with a removable storage bin measuring 24 by 20 by 15 inches deep, which prevent loose items from getting tossed around and lost in the bilge area. Located on the centerline between the storage bins is an optional 7.5 kW diesel generator, with sound shield. Its location under the cockpit will help to minimize noise inside the cabin. Stepping up to either side deck, a stainless steel rail provides a solid handhold, and stainless rails along the upper cabin house are at an easy-to-reach height. Safety rails, at 27 inches high, allow safe travel from the cockpit to the bow. While the decks along the cabin sides are only 8½ inches, they widen as one walks forward. Beautifully sculpted, folding bow, stern and spring cleats are an especially nice touch and prevent painful toe-busting moments. A fiberglass anchor platform, stainless roller and electric windlass are standard. Though they seem low, the 27-inch high rails offer plenty of protection for getting around the outside of the boat. The saloon features a generous amount of rich cherry woodwork. 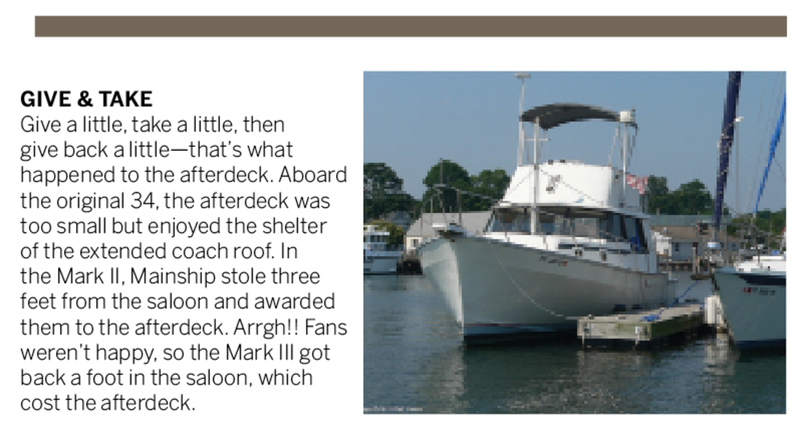 To those who have been aboard one of Marlow’s large motoryachts, the scene is familiar, albeit on a smaller scale. 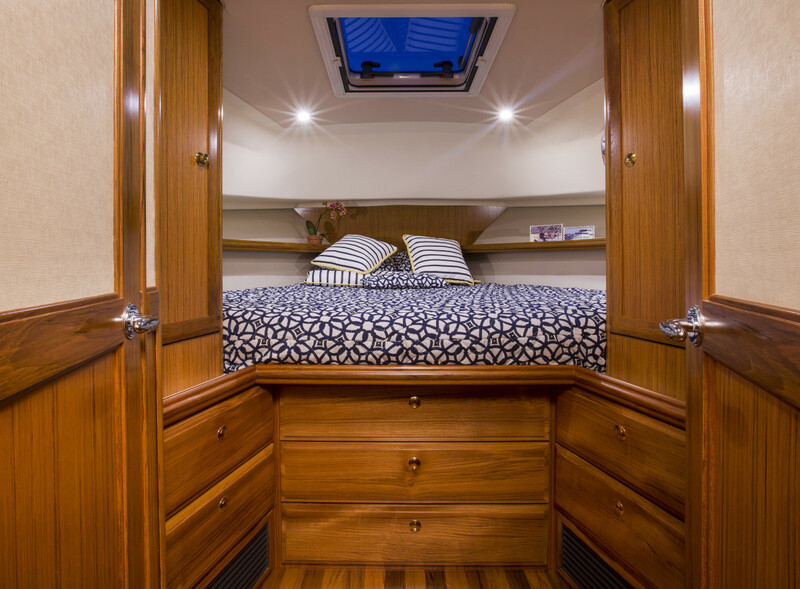 Even the cabin sole is finished in hardwood planking, giving the boat a luxurious feel. To port is a three-seat settee facing an attractive adjustable dinette table. 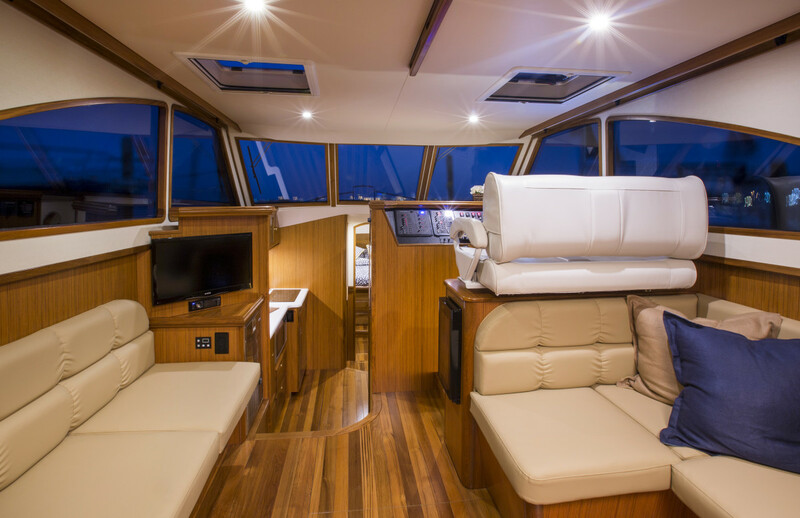 To starboard is a shorter settee, with a 32-inch flat-screen retractable TV behind it. Forward, twin adjustable helm seats are positioned up high on top of a wood cabinet that houses a wine chiller, directly across from the built-in ice machine. The elevated position of the helm seats provides excellent sightlines forward, but without a proper step or raised platform, they are difficult to get into unless you’re 6 feet or taller. Lippincott assured me the factory was working on a solution. A couple of foldaway steps or even a raised platform with built-in storage underneath would do the trick. 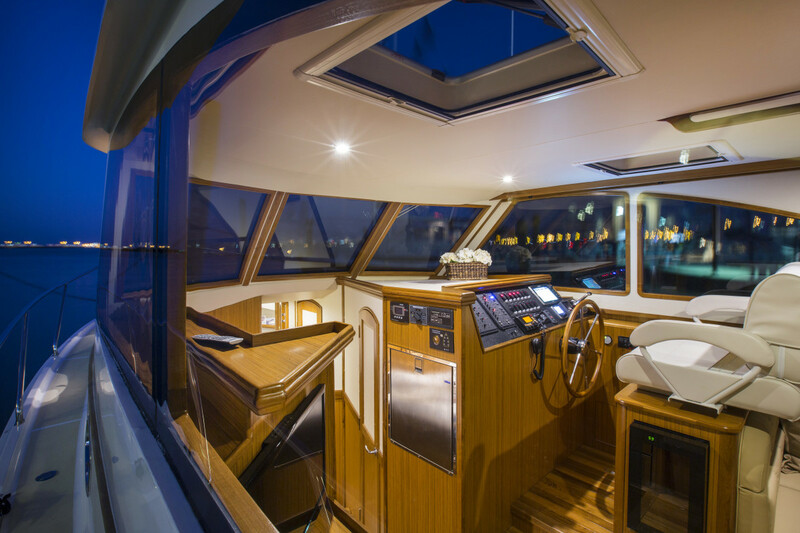 While some buyers may wish for a pilothouse door, access to the cockpit is easy, and a door would only complicate matters and ruin the sleek lines of the cabin sides. Marlow has chosen fixed side windows in the deckhouse to eliminate leaks. To provide good ventilation, the center section of the windshield opens, as does the clever drop-down sections of the glass bulkhead aft. In addition, there are two overhead hatches in the saloon to provide even more airflow. 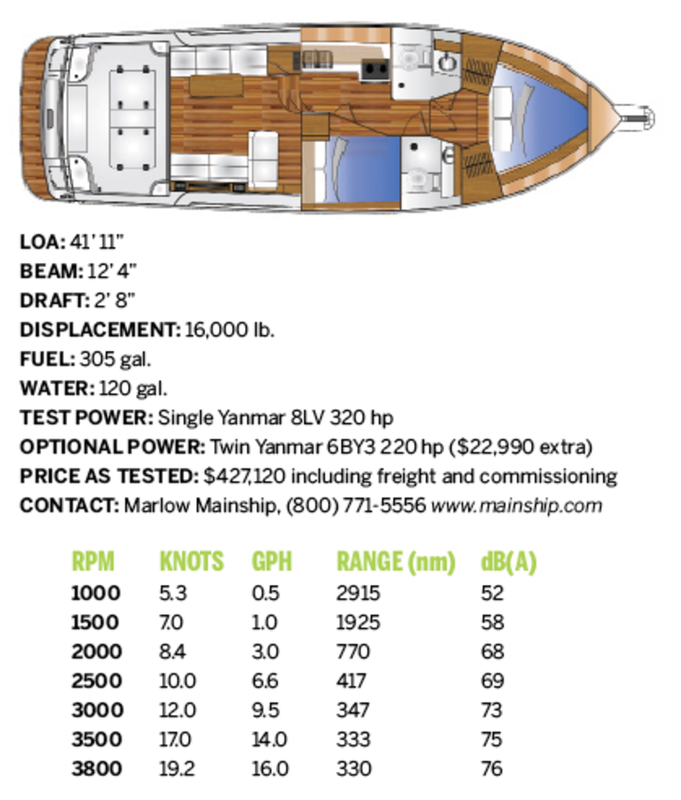 With a centerline height of 79 inches, the saloon feels voluminous for a 37-foot boat. The helm area is well designed with enough room for a 10-inch multi-function display, engine instrumentation, autopilot, VHF radio and more. The twin seat arrangement will encourage one’s first mate to be an active participant in navigating and running the boat. This particular Marlow-Mainship 37 features a single Yanmar 320 hp diesel engine, but it may also be ordered with twin Yanmar 220s. Bow and stern thrusters are optional. The single electronic throttle and gear shift unit is conveniently located on the starboard side of the dash but the engine start switch assembly, which also includes the kill button, is mounted on the side wall where it can be inadvertently engaged by accidentally leaning against it. This is not the first boat I’ve tested that had similarly positioned start/stop switches, where one can brush against them and shut down the engine. If the switch assembly can’t be moved, some type of safety guard should be installed. Directly to port of the helm seats are two steps that lead down to the galley and accommodations. One must be careful not to accidentally step into this stairwell when leaving the helm area, as it is cut out from the saloon sole. Its steps intrude into the saloon—not the galley—to save space below. For safety at sea, I prefer a totally flush sole from one side of the saloon to the other, especially in the vicinity of the helm area. To port, the galley is equipped with a convection-microwave oven, electric two-burner cooktop, refrigerator, freezer and stainless sink. 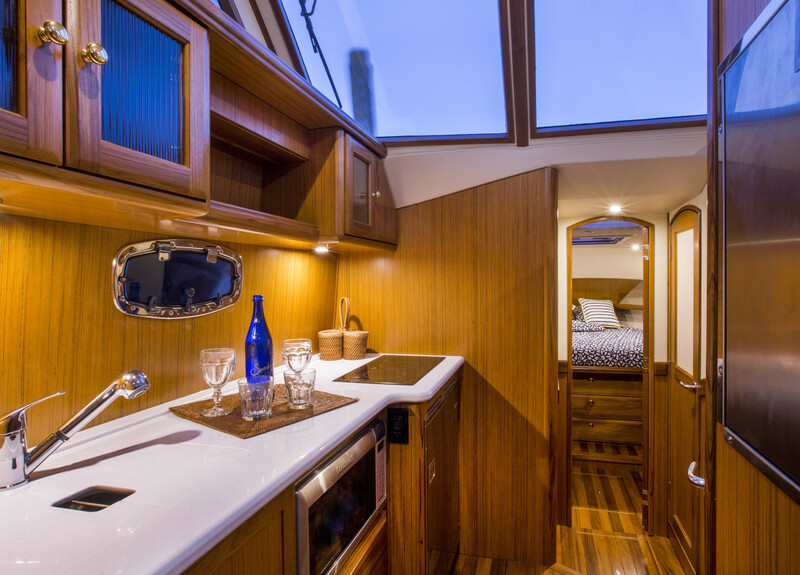 There’s enough counter space, drawers and stowage to satisfy the epicurean needs of most couples during weekends or even extended cruises. I particularly like having the separate refrigerator and freezer for longer cruises. A large opening porthole above the galley counter treats the chef to fresh air and water views. Across from the galley to starboard is the guest stateroom with a hanging locker and U-shaped settee that becomes a small double berth. An overhead hatch opens to the saloon just forward of the helm and abaft the windshield to provide ambient light, and an opening port provides ventilation. For those buyers who rarely cruise with guests, this stateroom can instead be finished as a dinette area. Being directly across from the galley, this setup seems very attractive and practical. It would be a perfect place to hang out with a laptop or book on a rainy day, and for those occasional guests, it could still be converted into a double berth. The 37&apos;s galley-down layout leaves added living room in the saloon. Forward of the guest stateroom is the guest wet-head utilizing a clever drop-down lid/seat covering the toilet when in the shower mode. To port is a larger wet-head for the owner’s cabin, which is forward. I wonder if buyers who choose the dinette layout over the second stateroom would also like to have the guest head offered as a large stand-alone shower stall. This would create a very nice owner’s suite. The owner’s cabin is almost overpowered by a very large V-berth that measures 96 inches wide at its head and narrows to 25 at its foot. Overall, it’s 76 inches in length. The stateroom also includes two cedar-lined hanging lockers, two opening ports and a large overhead hatch. To reduce the number of through-hulls above the waterline, a small sump pump is installed under the cabin sole to which the sink and shower drains feed. Access to the engine room is through one of two opening hatches in the main cabin sole. Having spent far too many hours in cramped, poorly lit engine rooms, this was, for me, one of the highlights of the boat. The open hatches reveal a cavernous space surrounding the Yanmar 8LV 320 hp common rail diesel. One can easily move around on either side of the engine for inspection and maintenance. There’s plenty of extra room on each side for storage bins of spare oil, parts and cruising gear. The aluminum fuel tank totaling 305 gallons is located athwartships, forward of the engine. Access to the bulkhead-mounted fuel filter as well as the sides, front and back of the engine will cause mechanics to smile from ear-to-ear when they lift the hatch for the first time. It was a beautiful fall day on the Chesapeake Bay for our test ride, and you will see by the accompanying chart that it was also a quiet day. Thanks to plenty of soundproofing material, as well as the solid hardwood cabin sole, engine noise readings were impressively low. Having run single-engine boats for years, I found this boat to be especially maneuverable and predictable, even when backing down. The optional bow thruster makes things even easier. Docking with the addition of a stern thruster would seem almost unfair. Sea conditions that day were extremely calm, so we had to rely on the wakes of passing boats to get a sense of how she handles. Dry and soft are the two words that best describe her ride. There was no slamming or pounding as we headed directly into oncoming wakes. Thanks in part to her strut keel, she also tracked well, although I would have liked a following sea to put her to a real test. The keel also protects the prop from damage in a grounding, and the shaft is virtually enclosed to eliminate rotational drag. With her single 320 hp engine, she seems to have two sweet spots: 2000 rpm/8.4 knots/3 gph/68 dB(A) and 3350 rpm/16.3 knots/12 gph/75 dB(A). Range with a 10-percent fuel reserve is 770nm and 375nm respectively. Factory supplied data on the twin-engine version (a $23,000 option) indicates that performance is roughly similar to that of the single engine version. Top speed is only 2 knots higher with twins, for example. But for those who feel more comfortable cruising to remote destinations with twins versus a single engine, Marlow offers both versions. 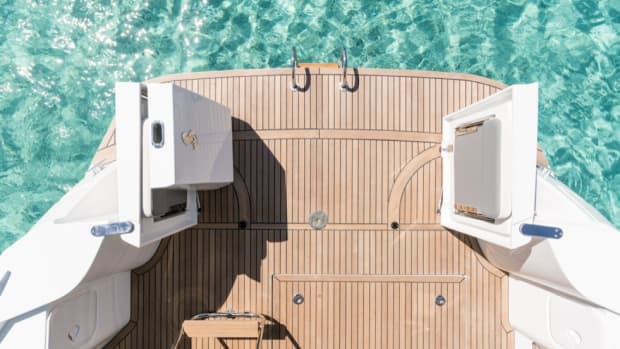 While the list of standard features is comprehensive, there are a number of worthwhile options available to fit one’s individual needs and cruising style. 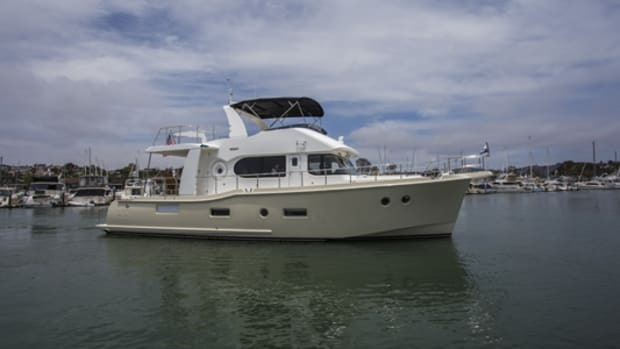 The combination of her fresh styling, advanced construction techniques, well executed details and quiet, efficient performance should put the all-new Marlow-Mainship 37 on the short list of those looking for a modern, capable coastal cruiser. Her base price of $359,990 and a typically equipped, delivered and commissioned boat costing around $425,000, seems to follow in the wake of the original Mainships—she’s a lot of boat for the money.